If you’re serious about working out, whether that be in a gym or jogging the local streets, then you understand the importance of having a dedicated headset for exercise. The market for sport headphones has boomed in recent years as the fitness industry in general has grown. There are different models with a wide array of shapes and features including wired and wireless, sweat-proof and waterproof, noise cancelling and more. Just in case you weren’t aware of all the options Men’s Fitness has compiled a list of some of the best sport headphones at any budget range. Unfortunately, with the advent of the jack-less iPhone 7, all these ranking lists are now completely outdated. You know you are going to get the iPhone 7 at some point. Maybe you won’t be lining up outside of Apple stores like some fanatics, but eventually you will want to upgrade, most likely when prices drop, after you get to play with your friends, or simply when your current mobile contract is up for renewal. Once you upgrade to the iPhone 7, or even if you wait for the iPhone 7s or iPhone 8, it is inevitable you will have a phone without a 3.5mm headphone jack. So with that said, there’s no time like the now to plan for the future. Because the iPhone 7 is so new, there isn’t yet a huge market of Lightning powered earbuds/earphones outside of the stock ones that come out of the box. But, being a fitness freak you need something a little more robust than the standard Apple earbuds. Well my friend, behold the JBL Reflect Aware’s. JBL are always looking to the future when developing their headphones. JBL brought the Reflect Aware Lightning connected earbuds to the market waaaay before it was known that the iPhone 7 would lose it’s headphone jack. When a company is as forward thinking as JBL, you know you’re going to get a solid product that is designed from the beginning to be “future-proof”. This makes these headphones a solid investment as you’ll be able to use them for YEARS. JBL is part of the Harman International Industries group. This group is American owned and includes famous brands such as AKG Acoustics, Harman/Kardon, Infinity and JBL. With experience making speakers and headphones for premium German automotive companies and high end audiophile headsets, you know you will get only the best out of JBL. Like all JBL products, you get a solid 1 year warranty with your Reflect Awares. Because the Reflect Aware’s come with an EQ app you can customize how your music sounds based on your personal tastes. You can fine tune the sound depending on what type of music you are listening to or whether you are working out indoors or outdoors. The lightning connector delivers superior audio quality as well as actual power to run the drivers in the earbud tips. All these equates to a sound quality that is superior to old fashioned, non-powered 3.5mm cable headphones and Bluetooth headsets. 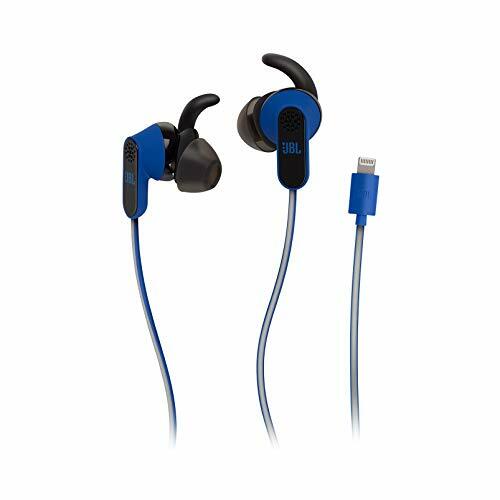 Taking advantage of the power from your phone these are some of the smallest earphones on the market to sport active noise cancellation. Previously it was difficult to provide active noise cancellation with earbuds because of their small size and because noise cancellation requires power, usually provided by AAA batteries, to work. However, because the 8pin Lightning connector transmits both music AND power, the JBL Reflect Aware’s are able to provide some of the best sport noise cancellation in the smallest form factor possible. These earbuds were designed from the beginning to be dominant for active individuals. This means they come out of the box completely “sweat proof”, water resistant and easy to clean. If you have used regular headphones for working out before you know how wet and nasty they can get after just a few workouts. Having earphones that can resist sweat and be quickly and easily cleaned means you’ll be able to use them more often and for longer. They also come with a multitude of ear tips to suit every unique ear shape. From traditional “bud” style tips to contoured ergonomic ear tips you’ll be sure to find a pair that seat the earbud securely and firmly in your ear so you don’t have to worry about them falling out in the middle of your workout. Finally, the cables themselves have even been redesigned for athletes. They feature a reflective cables that get attention and are almost completely tangle resistant, so you can just throw them in your gym back and go. Less time spent untangling knots, more time spent crushing the weights or the jogging trails! You can buy the JBL Reflect Aware’s at JBL’s website or Amazon. If you already bought a pair let us know what you think of them in the comments below! Visit our complete lightning product overview page to see how the Reflect Aware earbuds stack up against other lightning-capable competition!